Birds are always on the move, and such a swift move it is that it is difficult to follow them with a naked eye, let alone using a camera capable of freezing just that moment in time. Therefore, for amazing, top-grade bird shots you need to be accustomed to bird behavior as well with the camera technology that produces the best results, but without emptying your bank account. Thankfully, digital technology allows you to snap as many photos as you like, and just delete the ones that didn’t turn out right. And the more bird photos you take, the greater sense you will gain on what works, and what doesn’t. It is actually a fast learning curve once you get into it. But first, you must cover your fundamentals – choosing the right camera – which this guide will help you determine. If you are already accustomed to spotting birds with a scope, be it angled or straight, and you already have a quality smartphone (with an above 10 Megapixel camera) than you don’t really need another piece of expensive equipment. In that scenario, all you would need is a “universal digiscoping adapter” for smartphones. You can get one under $20. Simply enter any of those keywords into the search bar of your favorite online store, and you will be sure to get the most highly rated ones. Then just make an additional check if it is fully compatible with your specific smartphone model. Using scope+smartphone+adapter combo is quite an elegant solution, and certainly the most comfortable one as it allows you to capture photos from great distances, you don’t have to carry anything around, and you don’t have to worry about blurry images – scope offers superior lens clarity along with being mounted on a tripod for perfect stability. The possible downside is that you likely won’t have an auto-focus (only the flagship smartphones tend to have it), which allows for snappy and sharp pictures, but you can counter that by anticipating the bird’s move and taking photos in succession, discarding the blurry ones later. On the other hand, if you are not in a possession of both a scope and a flagship-grade smartphone, you need to become aware of some digital camera terms and features before going shopping for one. You may have already noticed that DSLR cameras and camcorders are all the rage now. They mark an entry into a higher level of imaging/video solutions – making you capable of going ‘pro’ – and are therefore more expensive. DSLR stands for Digital Single-Lens Reflex. In practical terms, a DSLR camera combines the best of the analogue and digital worlds by combining the superb optics of a single-lens reflex technology with a digital imaging sensor, which was previously a physical film roll. DSLR cameras tends to be an excellent solution for bird-shooting because they have an integrated auto-focus. Auto-focus is critical for getting sharp images of birds on the move, thus greatly increasing the range of possible photos you can take, without worrying if they will turn out blurry. Furthermore, when you attach a 400mm telephoto lens to one of these cameras, you can get absolutely perfect results, undistinguishable from ones taken by professional photographers. Fortunately for you, DSLR has almost become a standard by now, which means that all the major manufacturers are in fierce competition with each other, thus drastically lowering the price of DSLR cameras. In short, what only professional photographers were opting for a decade ago for thousands of dollars, you can now get for under $300. Canon, Samsung, Nikon, and Panasonic have proven to be the most consistently reliable brands. All you have to look for then is choosing the right bundle; some come with telephoto lenses while other don’t. The integrated optical zoom for most DSLR cameras should prove more than sufficient for most bird-shooting situations, but if you think it won’t be enough, choose the DSLR camera bundle with telephoto lenses. The difference usually doesn’t exceed over $100. Telephoto lenses will also make the photos appear as you have taken them a few feet away from you. Besides the extra price, the only downside to them is that they are very bulky. Additionally, when choosing the right DSLR camera, you shouldn’t concern yourself too much about the megapixel count. The default for almost all of them is well above 10 megapixels, which is an overkill anyway and it only benefits you when taking very-high resolution photos – more than 4k (for example, above 4k TVs don’t even commercially exist yet). What is far more important than the megapixel count is the quality of the digital imaging sensor and auto-focus precision. But yet again, if you opt for a DSLR camera from the aforementioned brands, you will upgrade by default to that level of quality, with one exception – image stabilization. 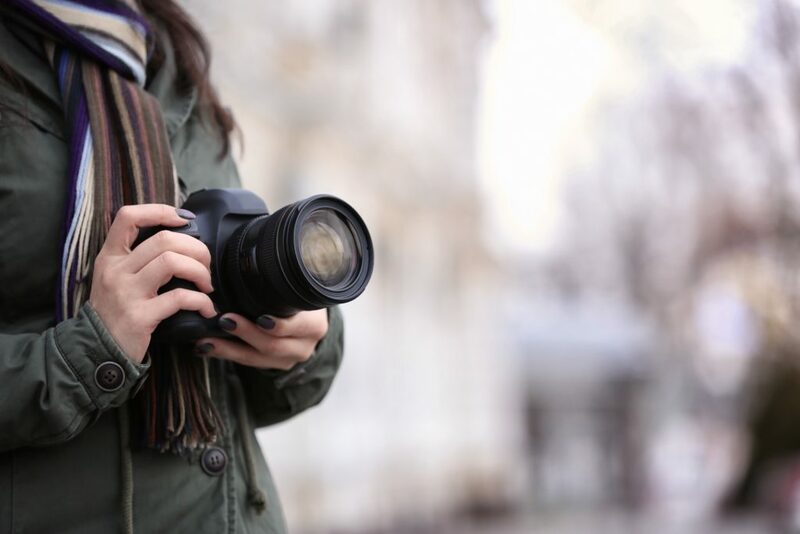 If you are not sure that your hands are steady enough for prolonged periods of hand-holding, which will tend to produce less-than-satisfying photos, then definitely find out if the DSLR camera has that feature. For taking outstanding bird photos – ones that are even worthy of selling – you need to have three assets. A “good eye” for birds. That means knowing your area for what kind of birds you can expect to find. Not all of them are equally photogenic and worthy of the effort, not to mention the expenditure for extra equipment. Knowing bird behavior is another important aspect of bird-shooting. This will allow you to instinctively sense just the right time to shoot them: just the right background, just the right lighting, and just the right form. It goes without saying that if you are already into birdwatching, you will have no trouble with this, and you can always take hundreds of photos with digital cameras, so you can just pick the best ones later. The right equipment – DSLR cameras are certainly the safest route for the most pleasing bird-shooting results – but if you are fortunate enough to have a widespread vista from your backyard, then adapting a smartphone to an angled spotting scope on a tripod would be the culmination of comfort and convenience, while achieving equally satisfying results.